I'm officially on leave now as we await the arrival of our daughter. It's an adjustment to suddenly be on an extended vacation, since I'm used to spending my days moving as busy as a hummingbird. 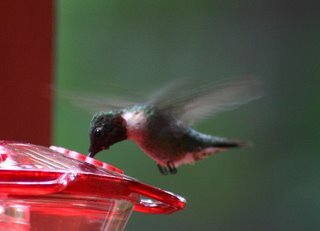 Or do hummingbirds only appear to be busy? Last evening, looking out the window into the side yard, I noticed a hummingbird stop to rest on a tree branch. Every few minutes she would go swooping over the house, presumably to visit the feeder on the back porch, and then return to the tree a minute later. What a life. Rest. Eat. Rest. Repeat. Another surprise was that I saw this same hummingbird swipe at a large insect. I thought hummingbirds only drank nectar! Come to find out, 50% of their diet is insects! So just putting out the feeders is nice, but the hummingbirds probably also like the flowers in my garden, since they attract more insects for them to munch on. My husband asked another interesting question- do humming birds sleep? Yes, they actually can go into such a deep sleep-like state that sometimes people assume they are dead! The hummingbirds lower their metabolism at night by 95%, lowering their body temperature and conserving energy. They wake up automatically about an hour before dawn. 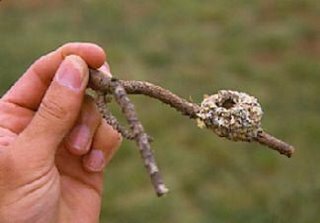 I'm going to take a look this week to see if I can spot a humming bird nest. Well I better bring along the binoculars. The nests are so tiny! Photo by Bill Hitan Jr. The Pentas lanceolata deserves the nickname "Starflower" for its performance this summer. 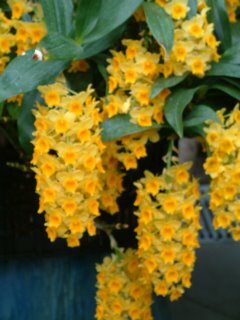 While hanging out poolside in large containers this summer, they continue to bloom and bloom and bloom. According to some sources, they attract butterflies and hummingbirds. I've had a good share of hummingbirds in my back yard this summer, but they seem to prefer the feeder. Sigh. It seems even the humming birds are becoming Americanized these days and prefering fast food. 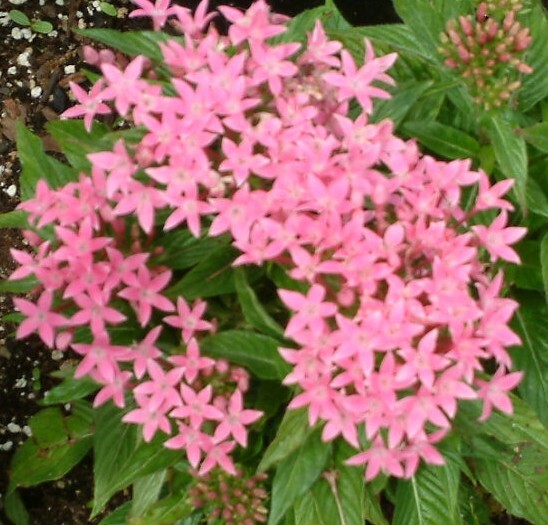 Anyway, my only disappointment with the Pentas is that I recently found out that they are annuals. (They were apparently placed in the wrong section of the garden center.) I was hoping for a repeat performance next year, but it will be worth the $2 each to buy a couple more of these plants next spring! Are you a gardener that likes it hot? (Or at least tolerates the heat?) Starting with the Moss Rose, I've started a series of posts on plants that seem to thrive in hot, dry conditions. If you have suggestions, I'd love to know about them. I figure it will be a great starting point for next spring to go back to this series. Also, I'd love to hear what *does not* work for you. I have tried zinnia and verbena this year, hearing that they like it hot, and I don't agree. Perhaps the problem was putting them in containers? I have another couple plants to feature in the next month, when hubby remembers where he put the digital camera. The conservatory is very lovely. I liked the layout, featuring several rooms with joining courtyards. The houses were recently refurbished, too, and everything is well maintained. 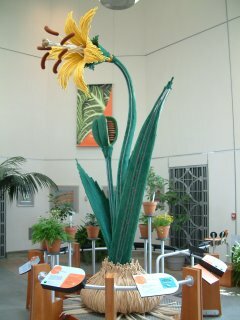 One of my favorite rooms in any big conservatory is the "desert room." 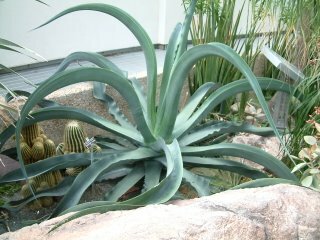 This agave is nestled among the cacti. I was surprised at the location; we stumbled across it on the way to the Capital Building! It's located right along the mall area. It's nice that the US Botanical Garden provides a green oasis among all the stark marble, but the drawback is that there isn't much room for actual gardens. Keep in mind, though, that visiting the Missouri Botanical Garden and Royal Botanical Gardens in Melbourne have probably set the bar too high for me as far as botanical gardens. I thought to deserve the name "US botanical garden" there should be acres and acres of gardens, so I was a little disappointed. But the conservatory definitely makes it worth a visit! Since I've been sidelined from heavy gardening during my pregnacy, I'm developing a green index finger; everything I point to seems to be doing really well in the garden this summer. The newly mulched beds look great. I spent a grueling half hour on the Internet researching types of mulch. My eyes were quite strained from trying to distinguish between the pictures of "double ground" and "triple ground" mulch. I spent 5 minutes in the suffocating heat asking P and K if they needed water. And then there was my effort to convey sincere sympathy when they both developed a reaction to poison ivy later that week. The roses are also doing great. I had to strain with all my might to trust my husband to move them to a sunnier location. Then I spent minutes supervising the fungicide treatment. Then there was the recent well-planned mission to assassinate the whitefly on the tomato plants. My husband purchased the insecticidal soap, and then my dad was in charge of locating and spraying the insecticidal soap. But of course, I was the mastermind behind this successful plot. I wish I could take credit for the high quality rainwater that has been falling this summer. This post was inspired by the Onion - "Having a Gardener is a Wonderful Hobby"
I found this nestled along my climbing rose. Anyone have any idea what it is? There's definitely something alive in there. 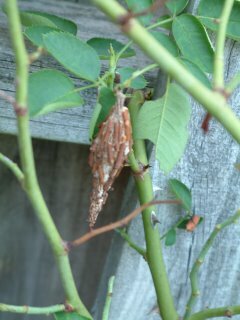 Maybe it's some sort of insect cocoon?